Welcome to Rocky Mountain Storm Lacrosse Club! Rocky Mountain Storm Lacrosse Club is a non-profit volunteer lacrosse organization with a mission to provide affordable lacrosse programs to youth boys and girls of all skill and experience levels living in the northwest suburbs of the Denver Metropolitan area, including Lakewood, Green Mountain, Golden, Wheatridge, and Arvada. Please sign up to receive emails about our lacrosse programs by clicking the "Join our Email List" link on the left menu bar. For more information, please check out our website or contact a Storm Volunteer Board Member. IMPORTANT DATES FOR SPRING 2019 SEASON!! 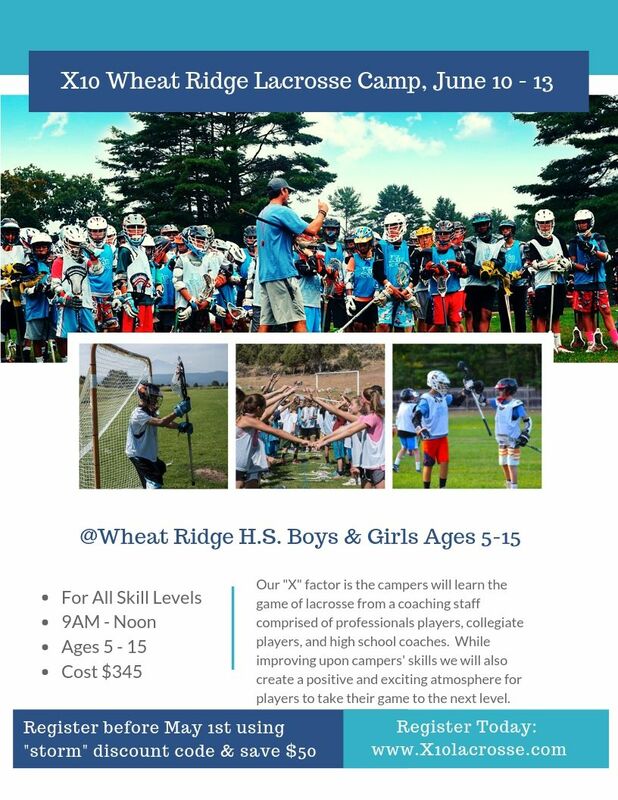 Sign up for any Overnight camp and receive 50% off the Wheat Ridge HS Day Camp! IMPORTANT DATES FOR SPRING 2019 BOYS and GIRLS LACROSSE SEASONS! September 23rd and 30th, 2018: Boys Spring 2019 Red Level Team Tryouts for Age Groups U10, U11, U12, U13, and U15 at Pennington Elementary School - REGISTER TODAY! December 2018: Boys and Girls Spring 2019 Lacrosse Registration Opens SOON! January 11, 2019: Boys and Girls Spring 2019 Registration Closes!! Any registrations after this date depend on availability and pay a late fee. January 15, 2019: Last Day to order Uniforms! Please order yours by TODAY! Go to www.warrior.com/storm to order jersey, shorts and SS tech tee. UPDATED for Fall 2018 and Spring 2019: The CYLA (Colorado Youth Lacrosse Association) will continue to use June 1st as the cutoff date for boys lacrosse age-based classification. The CYLA has permanently adopted US Lacrosse guidelines regarding age-based classification. Therefore, Rocky Mountain Storm Lacrosse Club will group teams on the basis of grade with an age cutoff. Players in the same grade will generally be grouped together, provided that they meet the June 1 birth date cutoff for that age group. All players are required to provide official proof of birth date (birth certificate, passport, adoption papers, etc) before participating in sanctioned CYLA games. We will set up teams at U15, U13, U12, U11, U10, U9, U8, and U7 for the 2019 Spring Season. All current 8th graders are eligible to play, regardless of birthdate. No high school players are permitted to participate. A player's eligibility for the 2019 Spring Season is determined by his age on May 31, 2018. For example, any player born on or after June 1, 2005 is eligible to play U13. A player born on or before May 31, 2005 is not eligible to play U13 and must play U15. In general, we will group players on the basis of "Grade with an Age Cutoff." This means that players in the same grade will be grouped on teams at the same age level, provided that they meet the June 1st cutoff date. Players who are "young" for their grade will play at their grade level. For example, a 4th grader who is age-eligible for U9 (ie born after 6/1/2009) will play U10. On rare occasions, where we need players to fill teams for an age group, we may ask a late birthday player for his grade to play with the lower age group. NO PLAYER WILL BE PERMITTED TO "PLAY DOWN" IN AGE CLASSIFICATION AS PER CYLA RULES-- NO EXCEPTIONS. 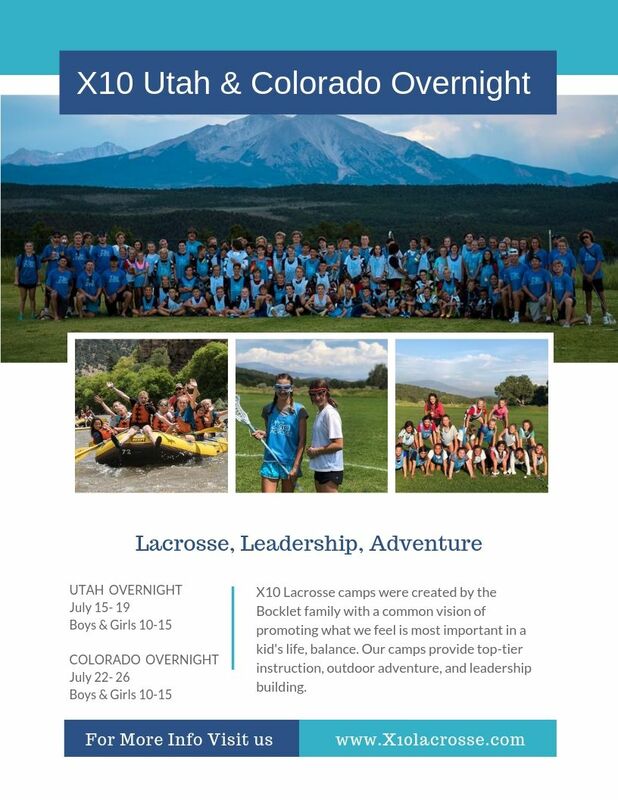 NOTE: For girls youth lacrosse age group eligibility please visit the Colorado Girls Lacrosse Association at cglax.com. BUY YOUR COLORADO MAMMOTH GAME TICKETS using the link below and proceeds will help fund Storm Lacrosse Player Scholarships!! Get your discounted tickets for any Outlaws home game- Premium Tickets are $20 with a portion of each ticket going back to the Storm. Invite your family, friends, and neighbors to take advantage! See you soon. Go Storm and Outlaws!